We weren't sure from which angle to take The Prestige. A fancy-looking costume drama, it looked like it had pretensions to Oscar baiting. Its eventual revelation (to us, at least) that it is basically a fun, pulpy Gothic novel - think Edgar Allen Poe Lite - was unexpected. Were we missing something, or was it really this... silly? Because The Prestige was silly. But we don't mean silly in a pointless, childish way. We mean silly in a "villains twirling black mustaches while they cackle over their eventual dominion" way. It was fun. It was self-consciously stylized ye olde pulpe. It was DASTARDLY. Ha ha! Watch out, people - we may spear you with our rapier-like wit! 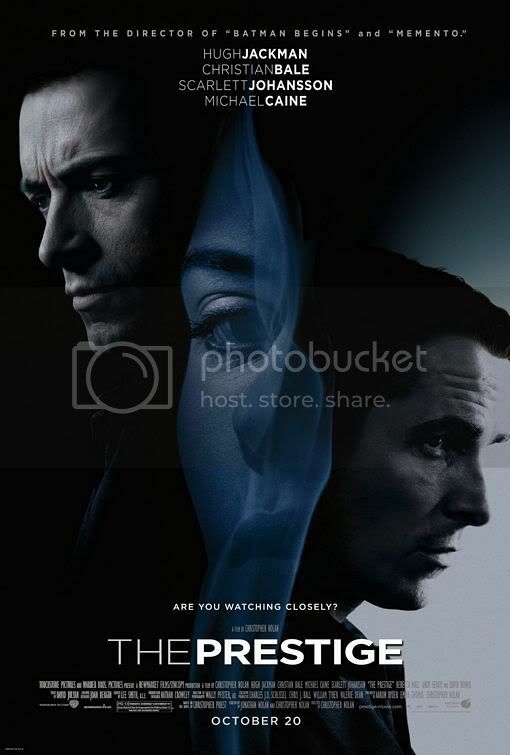 Following a dastardy duel to the death between a pair of competitively Ha ha!-ing magicians in 19th century London, The Prestige is directed by Christopher "he who brought us Dark Knight five times in the theatre" Nolan and stars Hugh Jackman and Christian Bale. If you saw Dark Knight, you should have an idea of the film's aesthetic: brooding scenes suffused with moody lighting, lots of shadows, and some funky storytelling. The Prestige's main plot worms its way out of a tangled straitjacket of Cluedo-style scenes which make light of chronology and, heck, the time-space continuum (seriously, it gets pretty freaky). We spent the first half hour trying to figure this movie out - "But what are the themes?!" we wailed, clawing at our copy of Roland Barthes. We spent the remaining time enjoying with more and more glee the slightly trashy quality of this murder mystery. Was it Hugh Jackman in the library with the candelabra? Or was it Christian Bale in the kitchen with the wrench? Our money's on Colonel Mustard. Ha ha! OMG they figured out how to make the Earth a giant outlet! Well, glam rocker/sci-fi fans that we are - and Mr. Serkis is pretty awesome too - we were just bought and sold. But we recognize that the film, particularly in the last half hour, acquires a whole new strangeness that may alienate the more conventional-friendly viewer. 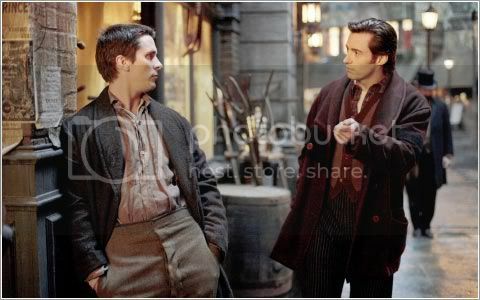 Oh yeah - and the actor who plays the actor who plays Hugh Jackman's double was also very, very freaky. Magic in the 19th century: not very safe. Hugh Jackman and Christian Bale are perfectly cast as two sides of the same coin, two approaches to the same job. Would you prefer to be lied to by the charismatic, sparkly charmer? Or perhaps you would prefer to be deceived by the brooding, gloomy tough guy? We love it when Christian Bale plays more thuggish characters, as he has a certain brute aggressiveness which is just great. Hugh Jackman is likewise perfect as the howdying, sunny American - and his descent into obsessional Gothic anti-hero was hence pretty awesome. Elsewhere in the cast are Scarlett Johannesen as a deceptive "my lovely assistant", the wonderful Rebecca Hall as Christian Bale's adorable, doomed wife, and longtime PPCC favorite Michael Caine. Oh, Michael Caine! We've read three biographies of this man. That's a lot of love. Do you know he first saw his wife in a shampoo commercial? OK, we'll talk about Michael Caine some other time. In the meantime, have fun watching two brooding, handsome anti-heroes duke it out using chunky, steampunk magic tricks in Victorian-era London. We certainly did! 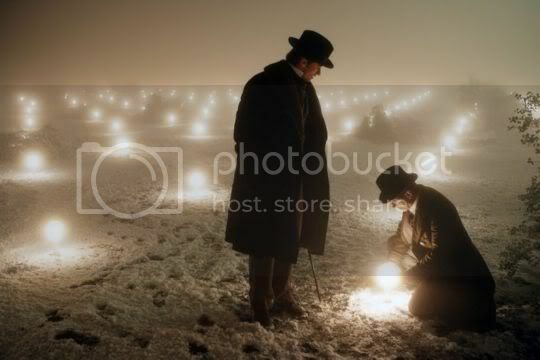 The Prestige is one of the few films I have seen where I was able to spot the twist right from the start and in this film's case it affected my viewing pleasure. And I don't like Hugh Jackman (gasp!) unless he is Wolverine in an X-Men film directed by Brian Singer. I like Christian Bale even less (and he is a very good actor). Same goes for Scar-Jo. Then why did I watch this film? David Bowie - in a small role but better than none and I love the director. the film itself is a gr8 nd diff approach,one since it is hard to define a hero..it is a very real effort,cos in real life everyone is a hero and also a villian..This is the approach,which makes Nolan film differrent from that of ny other director..
many folks didnt like the films editing,hey guys this could have been an ordinary film if it was edited in the normal way..and the future of films lie in the editors hands.U've been noticing that some good films told in a very conventional way of story telling is getting bombed at the box office,ever thaought why it occured?.its bcos the youth(the majority targeted audience group) hv been watching a lot of movies than before,that includes the old classics too.And most of the films till the later part of this decade is edited in a linear way,so they would like the story to be presented in such a way that it leaces no clue till the last few minutes,and its possible only by shifting/bending the normal timeline of the story,by earrangin it.. This one also pays tribute to the little known scientist Tesla(who was cornered by our celebrity scientist Edison),and also reveals the dangers and risks involved in the 19th century magic. Only a mind with such a gr8 clarity and concept could create such a movie,which im sure Christopher Nolan is.No wonder 4 out of 5 films,he did got into imdb top 250..